President Donald Trump has hit his highest approval rating ever in Wall Street Journal and NBC News’ latest poll, despite unprecedented negative media coverage. 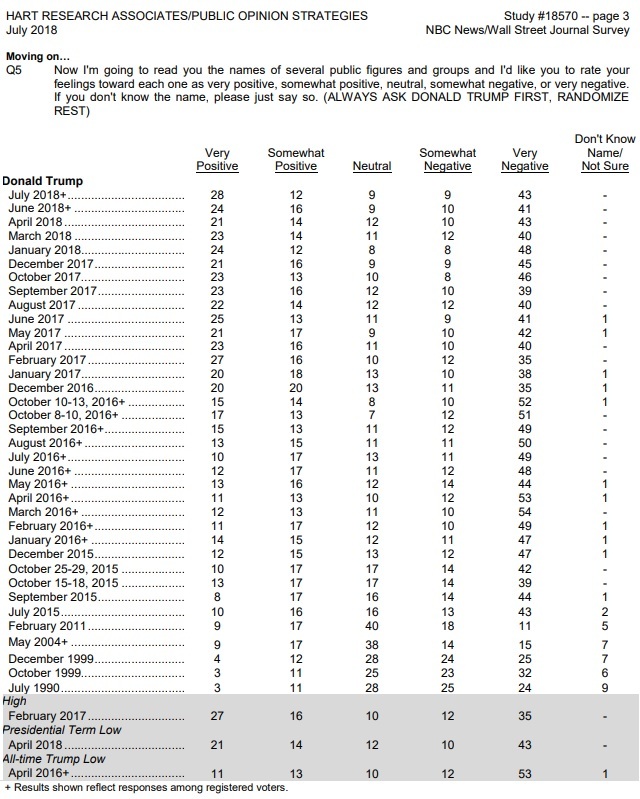 In the same week Trump was widely accused of “treason” by hysterical media pundits, deep state operatives and Democrat hacks for daring to question the same intelligence agencies which lied about WMDs in Iraq, Trump’s overall approval rating moved up 1 point to 45 and those saying they “strongly approve” of the job he’s doing jumped 3 points. “The more Trump gets criticized by the media, the more his base seems to rally behind him,” one Democratic pollster told NBC News. Trump hasn’t even begun to fight back. He told Tucker Carlson last week he’s open to declassifying evidence of the deep state’s crimes in the coming months (the president can declassify anything for any reason without any restrictions). NBC Snooze and the War Street Journal both decided to bury the lead in their coverage of their own poll. 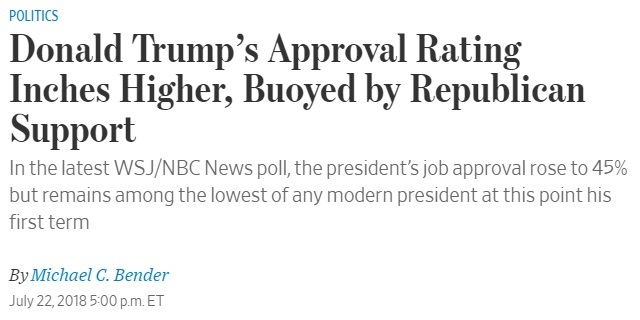 …the new NBC/WSJ poll finds the president’s approval rating among Republican voters at 88 percent — the highest of his presidency — and 29 percent of all voters strongly approve of his job, which is another high for Trump in the poll. […]And 50 percent of voters support Trump’s handling of the economy, which is up 8 points from October. …asked to name the top one or two issues that will decide their vote in November, a combined 36 percent said the economy and jobs; 33 percent said health care; 27 percent said immigration; and 20 percent said guns. Not covered is most voters have a positive view of ICE, 38-37, which Democrats are demanding be abolished. If the top issues are the economy, health care and immigration, that doesn’t sound very good for Democrats. Tax increases, Obamacare 2.0, and open borders to drive down wages is not a very compelling platform. That said, the media has been driving Dems into a frenzy with 24/7 fake news and hysterical propaganda telling them Trump’s making concentration camps for kids and wants to carry out a child holocaust, so it wouldn’t shock me if they had a strong turnout. Also, Google, YouTube, Facebook and Twitter have begun mass censoring conservatives and purging all their search results of any and all alternative media. Americans need to understand this is the future Democrats want for America. They want to open our borders, censor our internet, ban free speech, organize high-tech lynch mobs to destroy conservatives and harass them at their homes, institute communismand throw people in jail for calling the police if they’re not the right skin color. If average Americans had any idea the third world hellhole these radical leftists are going to create if they seize back power every last voter would show up to the polls and vote Republican across the board.